The southern two-thirds of the island is desert, right out of Utah. It is desolate and dry, with bluffs in the distance. 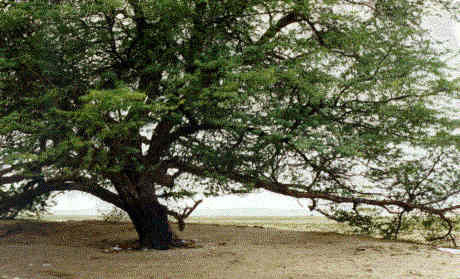 Right in the middle of this desolation, however, sits the "Tree of Life", a 400 year old mesquite tree. It is marvelously big, with several low branches extending out in various directions, just crying out to be climbed upon. Two or three farmhouses are in the general vicinity, with an odd number of corrals each having various creatures in them. The most interesting one is a truly random construction of boards and wire, with a few recognizable bird houses perched here and there. And a lot of birds. Mostly seagulls, but a few others as well. Heaven knows what draws them there, but they seem to have a home. When I visited the Tree of Life, there were a couple of young men that were happy to see me – they wanted me to take a picture of the two of them. I did so, and then wandered off by myself to climb the tree. Everyone should climb the Tree of Life, don’t you think? With a few creaky joints, even this old man was able do it. I spent the longest time just sitting there on my branch, staring out into the desert. At one point, another Bahraini joined the first two and the three of them decided to gather around and get their pictures taken with me! Wow! I am going to show up in a Bahraini scrapbook one of these days! Sitting in a tree.